3.8 (3800) Engine sensor locations. where is camshaft position sensor. on the front timing cover. Behind the water pump pulley. If looking straight at the water pump, it is a little to the left. where is the oil pressure sensor? the trans. ABS speed sensors are located at every wheel. steering pump, on the engine block. 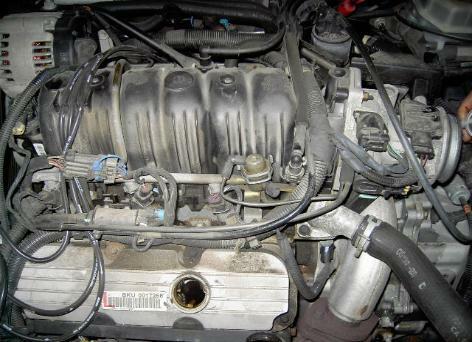 were is the fuel vapor hose tube located on a 1999 Grand prix ct 3800 6 cyl. Where is the Oxygen Sensor? Bank 1 sensor 2 to be exact. That sensor is the one behind the catalytic converter. Where is the crank position sensor located? the crank pulley on the front of the engine. I need vacuum line info on 3800 6 cyl supercharged engine. dies as good feel pressure. rich, which would turn the plugs black from fuel. freezing as well as raising the boiling point of water. Is there a sensor on or for my power steering pump or I dont have one. visible from under the car. Yes. What make, model and year vehicle? firing each set of companion cylinders? Thanks. side of the coil, while the other side becomes the ground. Then when the other tower needs to fire, it is switched. of 352 ohms and my gauge always stay at the lowest point. the cooling system capacity is due to the decrease in heat transfer. DOORS. USE ONLY THE KEY TO OPEN THE DOOR AND THE TRUNK. someone has stolen the car and shuts it off after a couple seconds of running. That is why you can't use the remote or electric locks. Can anyone pinpoint the location of the vacuum hoses on this picture? leek begins, removal of the upper intake in the very least will be necessary. trans. But it depends on which one you are looking for. Shift solenoid A, B, pressure control, ETC. idles fast after warmed up...seems less frequent on cool days. What is the OHM of the pressure sender for the oil is it between 10 and 180. Yes, that is within the correct range. Does this engine have a cruse control sensor? switch and vehicle speed sensors. Click this link for Sensor Locations. gear. You can run without it, but may be hard to start. acceleration,hesitates,hard starting,performance bad,jerking,timing seems off. throttle position sensor,or the knock sensor be the solution? throttle sensor could do it, but not the knock sensor. It should be located in a similar location as the 3800 coolant temperature sensor. Coolant leak under throttle body. Question: do you know what the tubing is called that goes from the top of the throttle body to the back side of the manifold? Answer: What model in your vehicle are you talking about? If I remember correctly that tube goes to the top of the rear valve cover. I think they just call that the valve cover breather tube. talking about. You may have to buy a kit which includes that tube and that seal. Ok, great, thank you for the help.